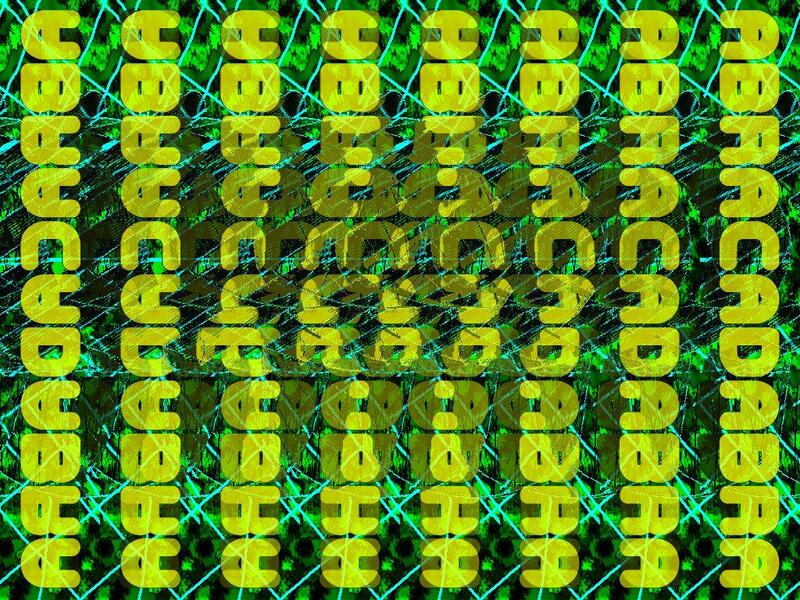 I like trying to develop innovative new techniques for constructing autostereograms. 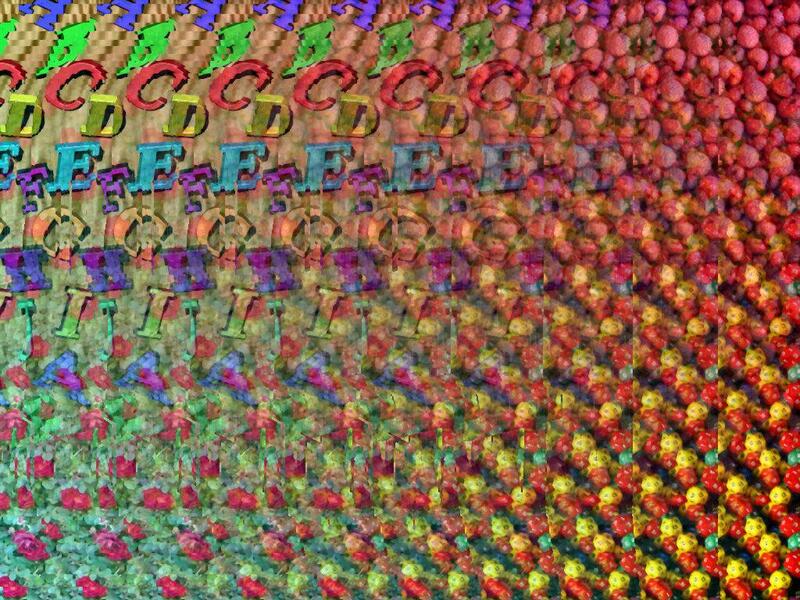 Here are a few wall-eyed autostereograms I drew and a description of what I was trying to achieve with each. Enjoy! 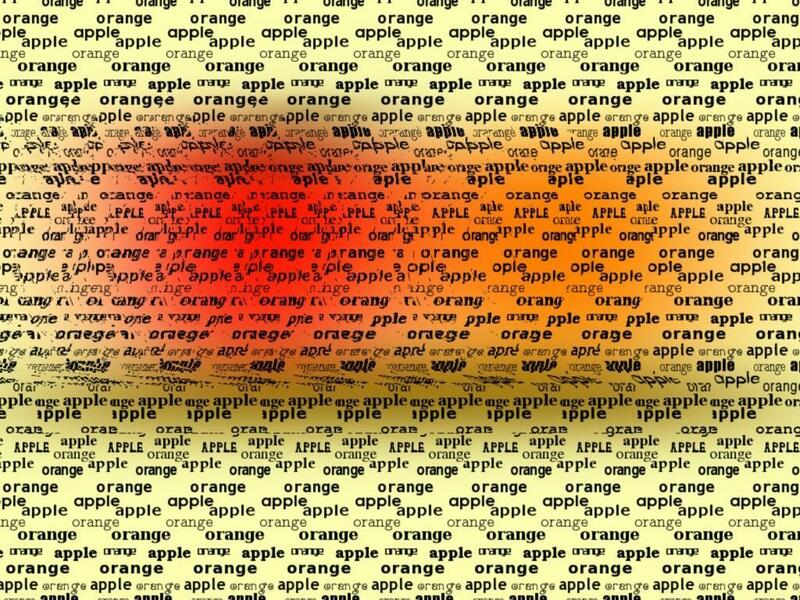 Apple and Orange I was curious if I could produce an autostereogram containing colored objects—something as close as possible to a true-color autostereogram. In Apple and Orange I tried to color the apple red, the orange orange, and the shelf they're sitting on brown. Wooden Chair I was wondering if it's possible to produce an image that's simultaneously an autostereogram and an anaglyphic stereogram (to view through red-cyan glasses). Wooden Chair is my first attempt to produce such a unified stereogram. The anaglyph image looks good, but I wish that the autostereogram were crisper. Beach Ball This is an experiment in including (faux) transparency in stereographic images. 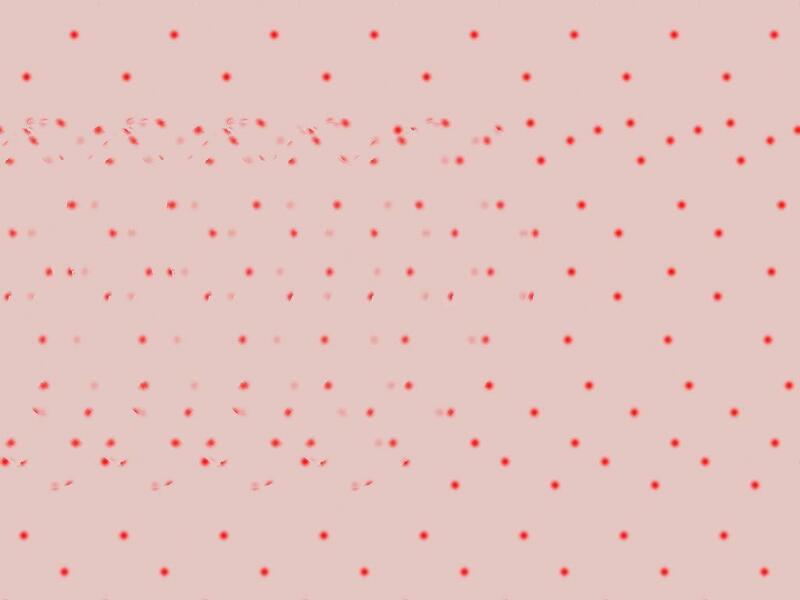 In Beach Ball, note how the ball has red spots in front and purple spots in back, and you can see the purple spots through the transparent red spots. I like how this image turned out. Pottery Sale This image represents an attempt to combine a wallpaper stereogram and a single-image stereogram. In Pottery Sale, the pottery is a wallpaper stereogram while the back wall and the front of the table are both single-image stereograms. Memories I wanted to see if it's possible to use more than one tiled pattern in a single image. (Answer: yes. ) Notice how in Memories, the pattern fades from an alphabet in the upper-left corner to raspberries in the upper-right corner to dice in the lower-right corner to roses in the lower-left corner. Who's on Top? 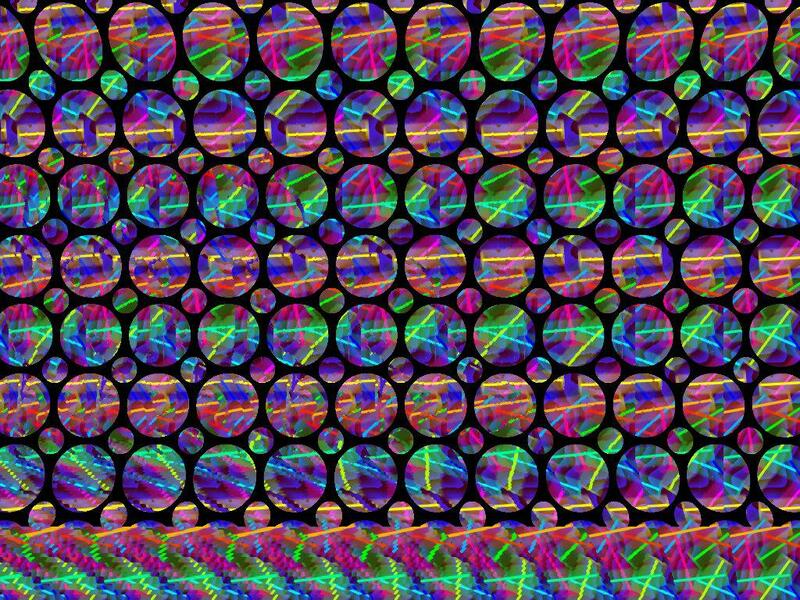 Let your eyes diverge when looking at this wallpaper stereogram. 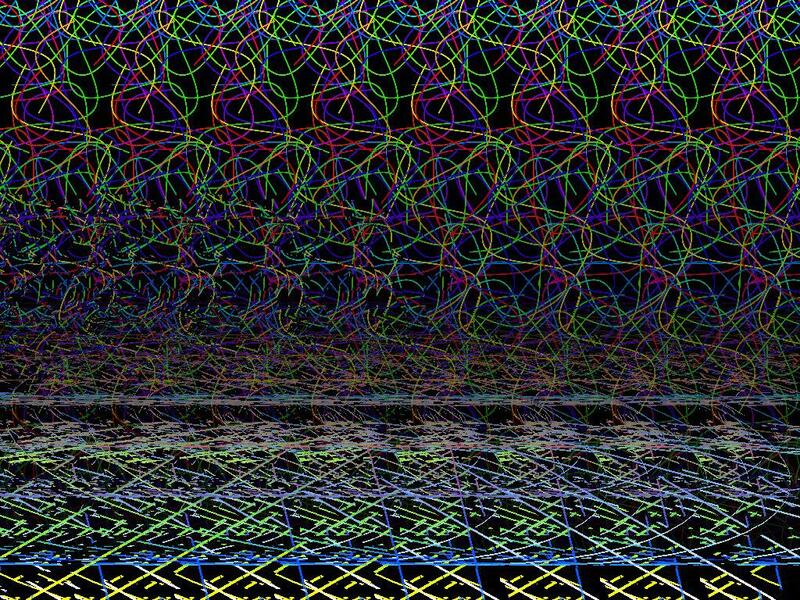 You should see the array of cubes floating above the array of spheres, which in turn are floating above the patterned background. Rotate the image (or your head) 90°. You should now see the array of spheres floating above the array of cubes, which in turn are floating above the patterned background. I'd love to perform a similar trick with a single-image stereogram but don't know how. Empty Table In Empty Table I used a single tiling pattern throughout the stereogram but varied the brightness. The result is an image that includes both illuminated and shadowed regions. Scattered Shards I struggled for a long time to find a way to produce a stereogram that can be horizontally and vertically tiled. All of my attempts ended up being flickery and hard to focus on. Eventually I gave up trying to tile arbitrary objects and limited myself to abstract shapes, which are a lot easier to deal with. You can see the result of my efforts in Scattered Shards. Maximize your browser window to get the full effect. Lovesick I was aiming for minimalism here—just a few dots on a solid background. Unfortunately, making the 3‑D image sufficiently clear required a lot more dots than I had intended. 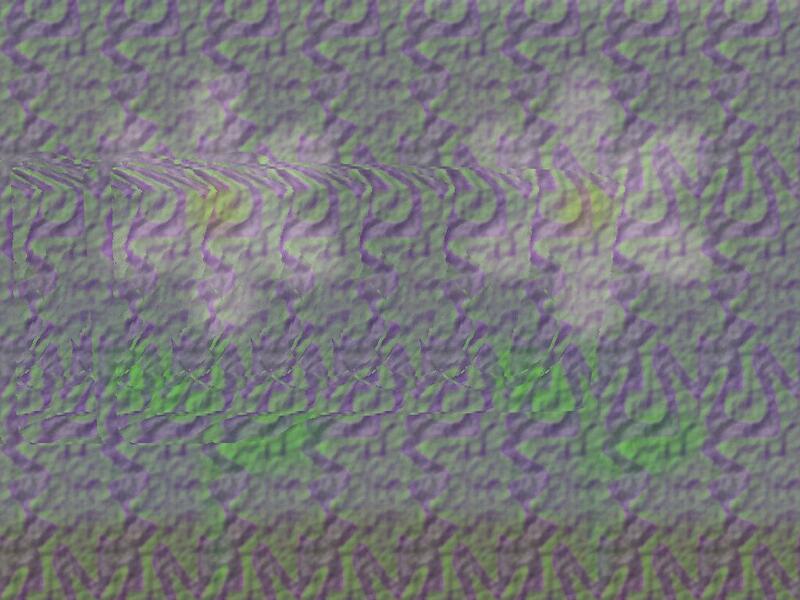 The good news is that I found that I could create a nice transparency effect à la Beach Ball (above) by superimposing two stereograms: one showing the top half of the object and one showing the bottom half of the object. Winter Scenes This may seem like an ordinary stereogram. However, it's really a subtle experiment with color. Once you've viewed the stereogram, try converting the image to grayscale then normalizing the gray levels. The result probably isn't what you'd have expected. Exclamation Mark I've made some progress towards the goal mentioned in conjunction with Who's on Top? (above): developing a single-image stereogram that contains a different image when rotated 90°. Exclamation Mark portrays a boxy exclamation mark lying within a crease. Rotate the image (or your head) 90°, and the exclamation mark vanishes while the crease remains. The rotated image isn't super-crisp, but I'm pleased that the basic effect seems to work. 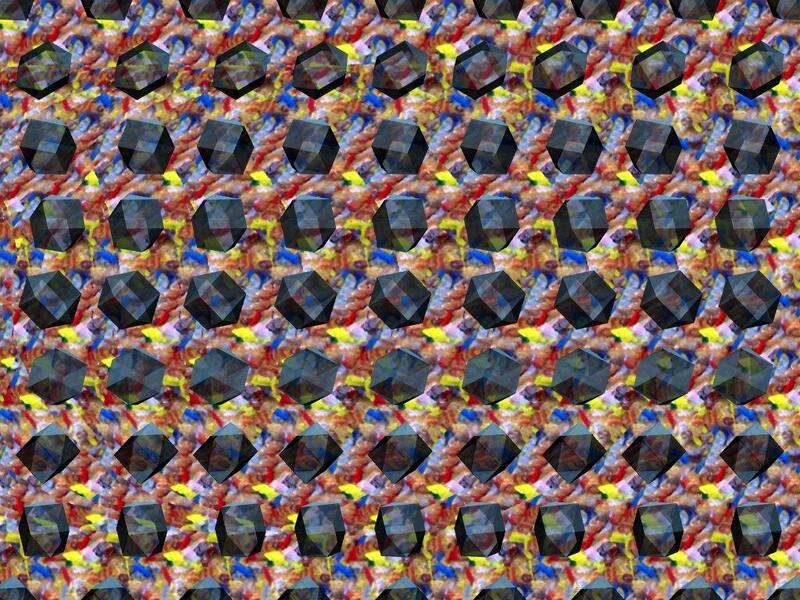 Stonehenge Like Bowl of Gems (above), this image superimposes a wallpaper stereogram over a single-image stereogram. 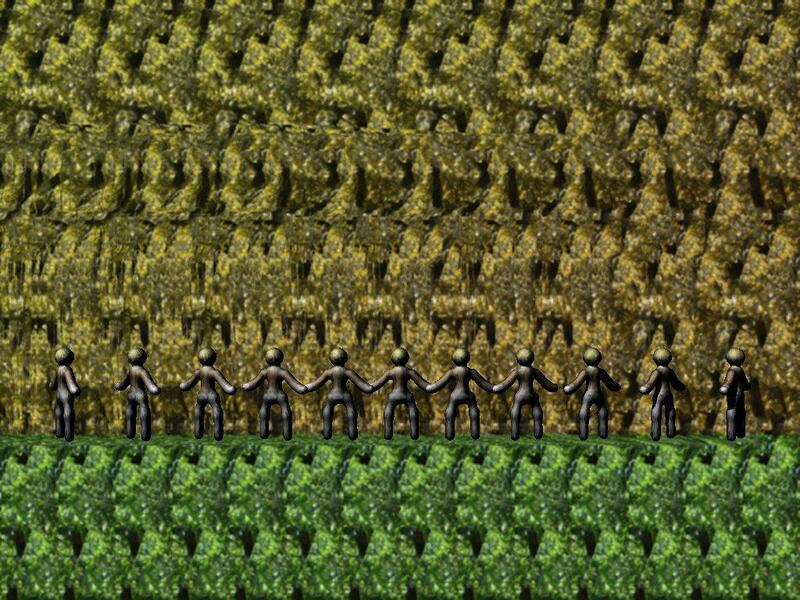 The difference is that in Stonehenge the wallpapered image (a line of people—who were supposed to be druids, but that's beyond my artistic ability) not only changes depth but also rotates as it repeats from left to right. Every Which Way Aha! 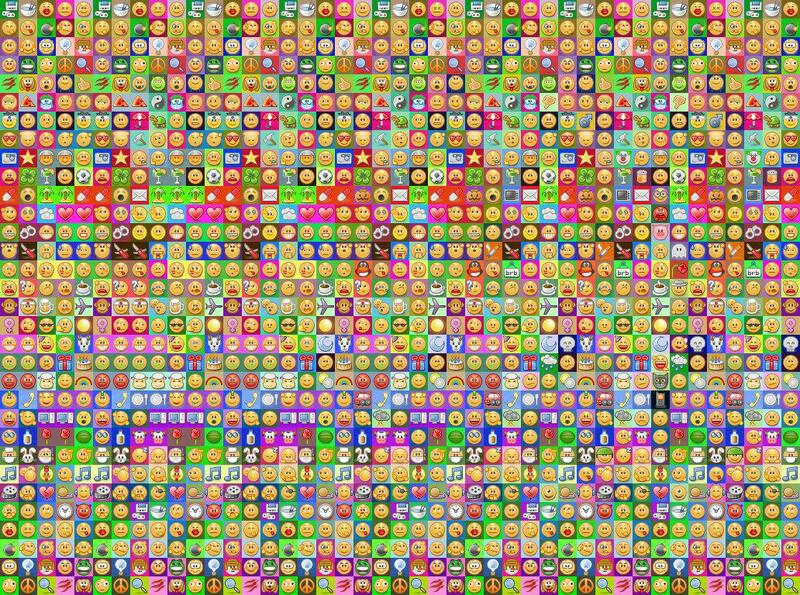 I finally figured out how to produce a stereogram that can be horizontally and vertically tiled yet can portray arbitrary shapes. While the approach used in Scattered Shards (above) handles only abstract patterns, my new approach is far more flexible. Every Which Way successfully represents a bunch of 3‑D arrows pointing in different directions. Maximize your browser window to get the full effect. 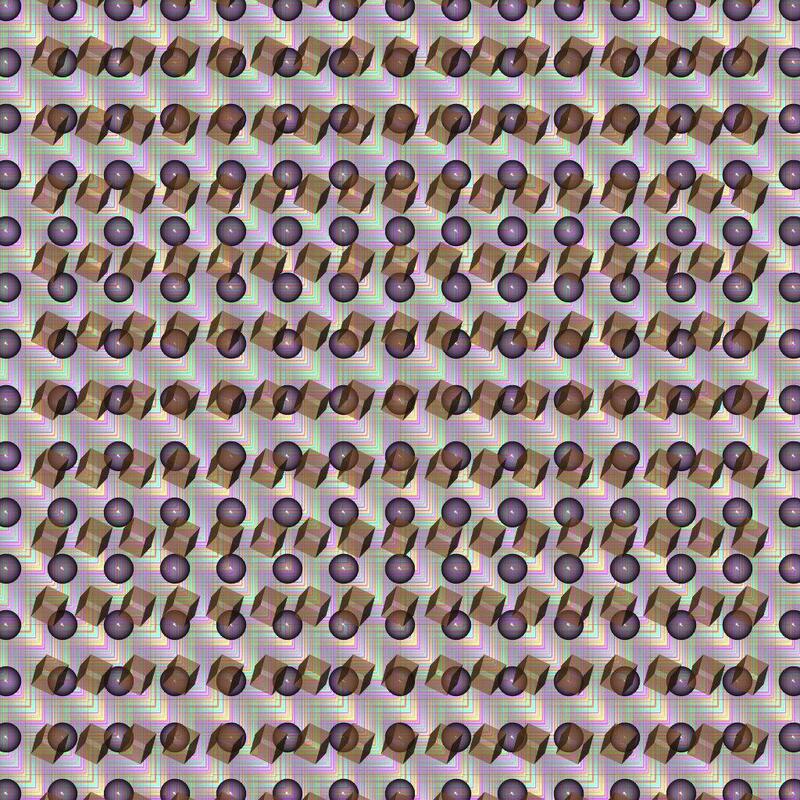 Put on a Happy Face When not viewed wall-eyed, single-image stereograms normally appear as a tiled pattern with some distortion (or as random dots that obscure the tiling and distortion). I wanted to see if I could produce a single-image stereogram comprising exclusively undistorted shapes. Put on a Happy Face is the result. 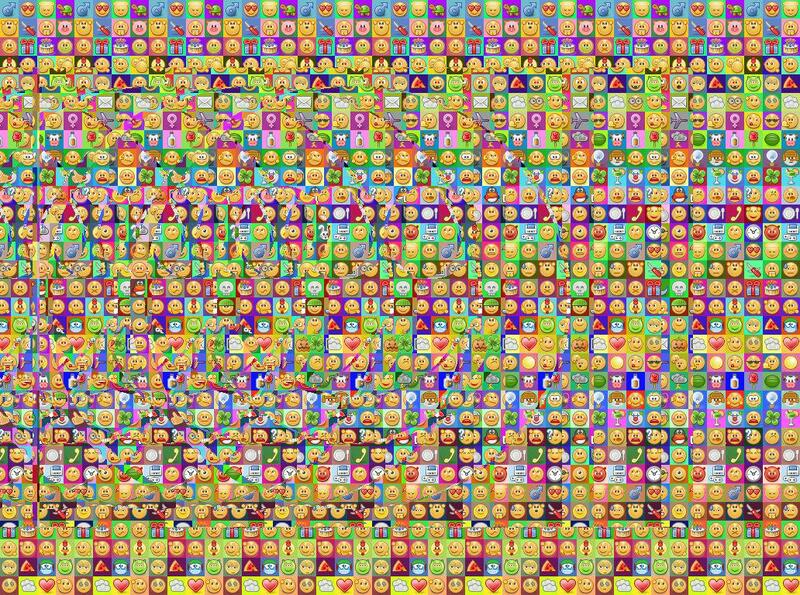 Note how it looks like an unassuming grid of emoticons, but diverge your eyes, et voilà!, a 3‑D image emerges. 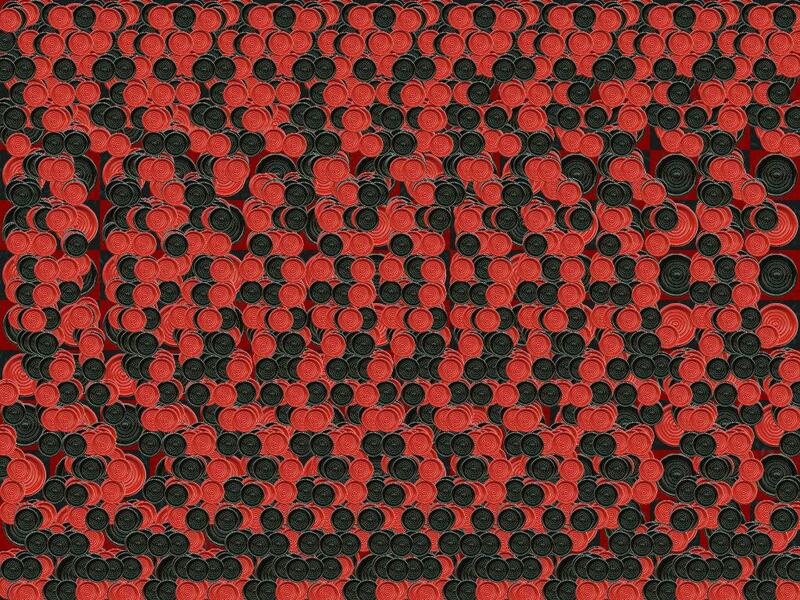 For contrast, an alternate version of Put on a Happy Face shows what the stereogram would look like with the usual distorted-tiling approach: uglier 2‑D but crisper 3‑D. 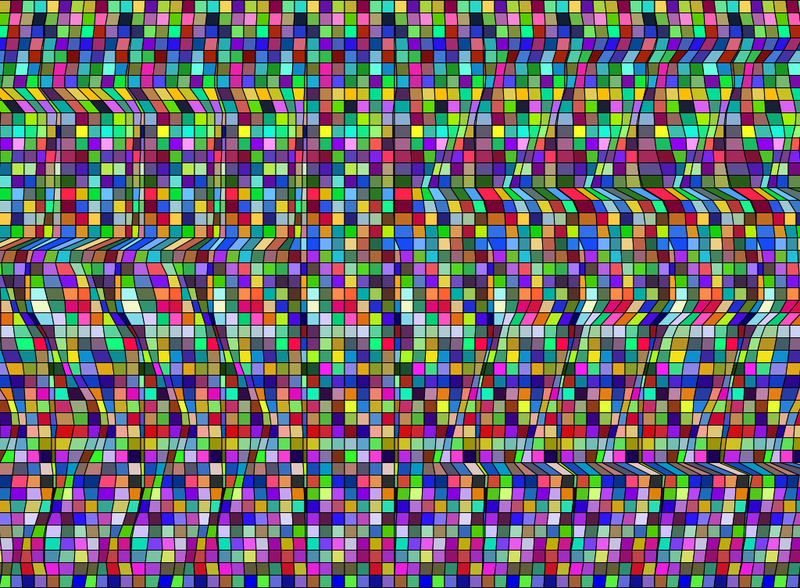 The Color of Music Observe how the colors in this image vanish when viewed as a stereogram. Pretty neat, huh? I aligned complementary colors in such a way that they cancel each other out when overlapped, and that seems to have worked exactly as intended. String Theory Is it possible to draw a single-image stereogram without taking your pen off the paper? String Theory demonstrates that it is. 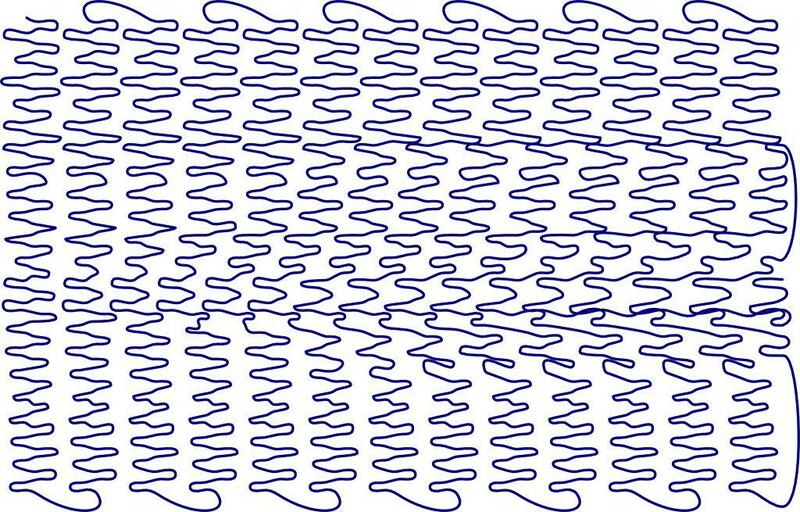 An SVG version of String Theory is also available as further evidence that single-image stereograms do not necessarily have to be bitmaps; vector graphics can work as well. Spider and Web New autostereogram artists quickly learn that thin lines are imperceptible when viewed in 3‑D. 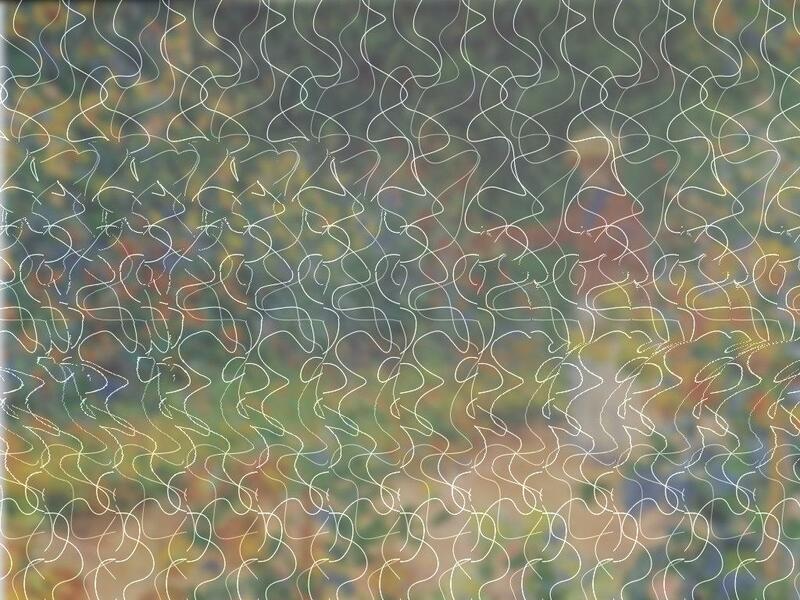 I wanted to see if I could include thin lines in an autostereogram and make them viewable by altering the 2‑D pattern to enhance their visibility. Spider and Web is my first attempt to do this. The thin lines that constitute the spider's web aren't perfect, but I believe they do demonstrate the feasibility of the technique. 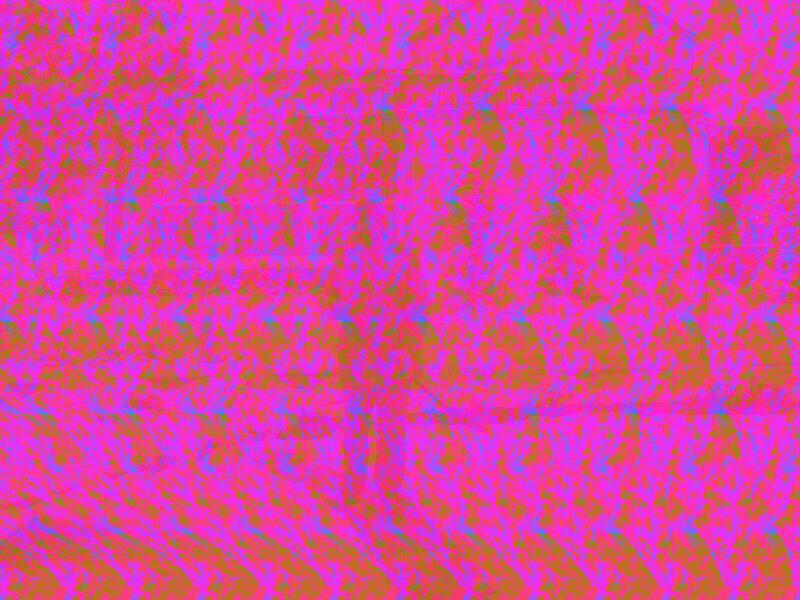 Tintinnabulation Tintinnabulation takes the notion of an ASCII stereogram one step further. 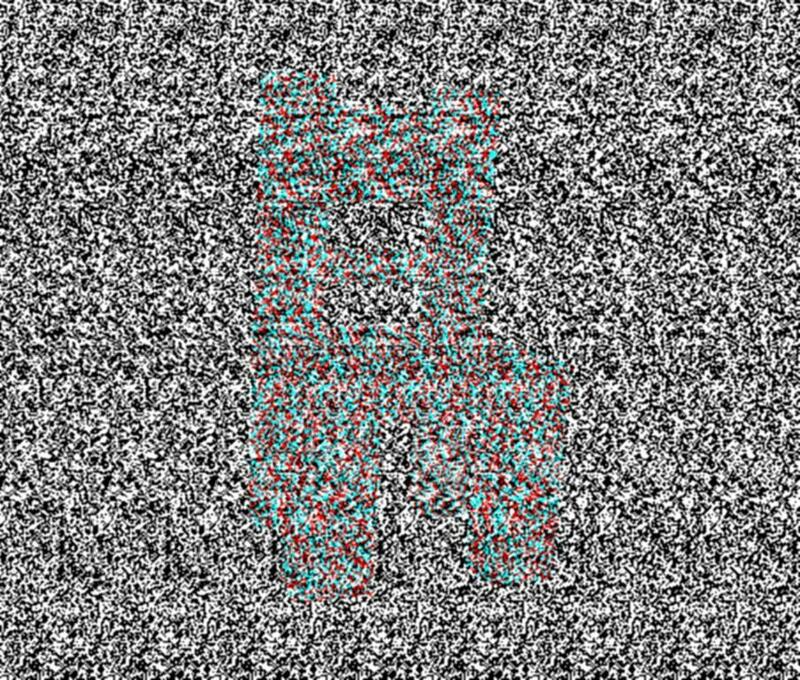 It demonstrates that an autostereogram can be constructed from undistorted, proportionally spaced text merely by adjusting inter-character spacing and dropping characters when necessary. (In case you don't recognize the text, it's the first 1½ stanzas of Edgar Allen Poe's, The Bells.) 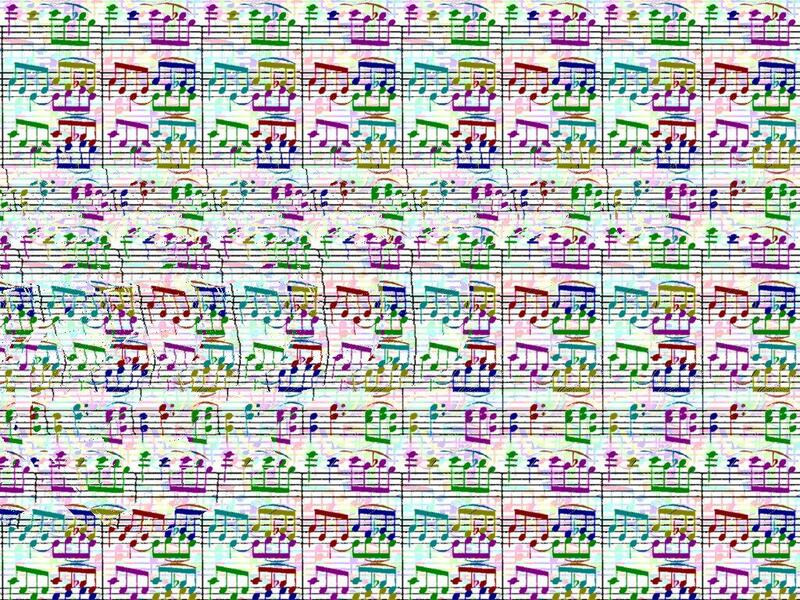 Note that the PDF version of the Tintinnabulation stereogram is fully searchable. Rotated Squares This one was a surprise to me. 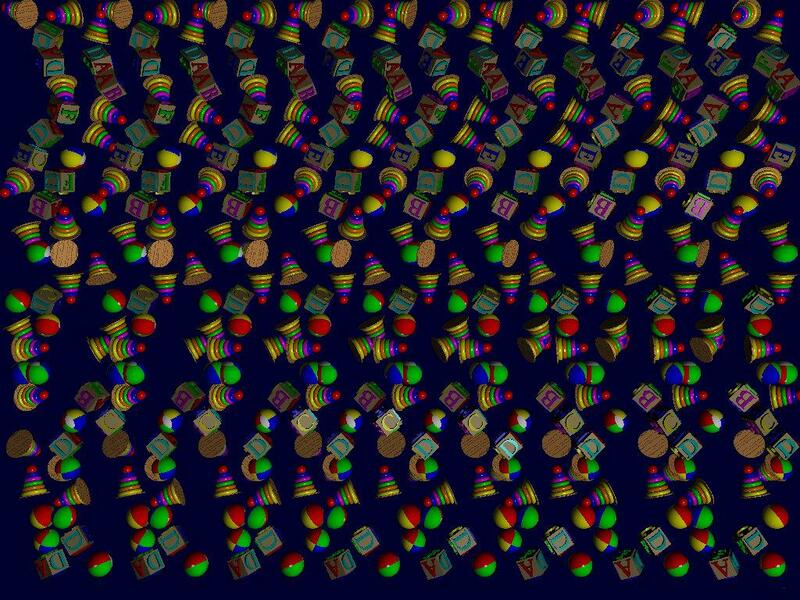 I was experimenting with rotation to see how well the eye can tolerate changes in angle in an object-array stereogram. 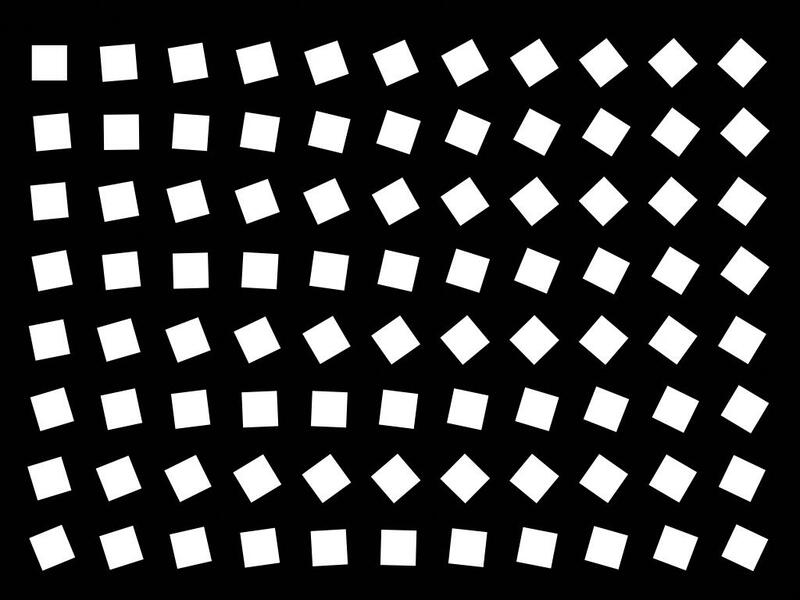 I didn't expect to see the wavy pattern that emerges when Rotated Squares—comprised entirely of evenly spaced and equal-sized but differently rotated squares—is viewed in 3‑D. An SVG version of Rotated Squares is also available. Row of Trees Row of Trees is what's called an object-array stereogram , which means that there's no hidden 3‑D image. Instead, when the picture is viewed wall-eyed, the (visible) objects in the image take on depth. 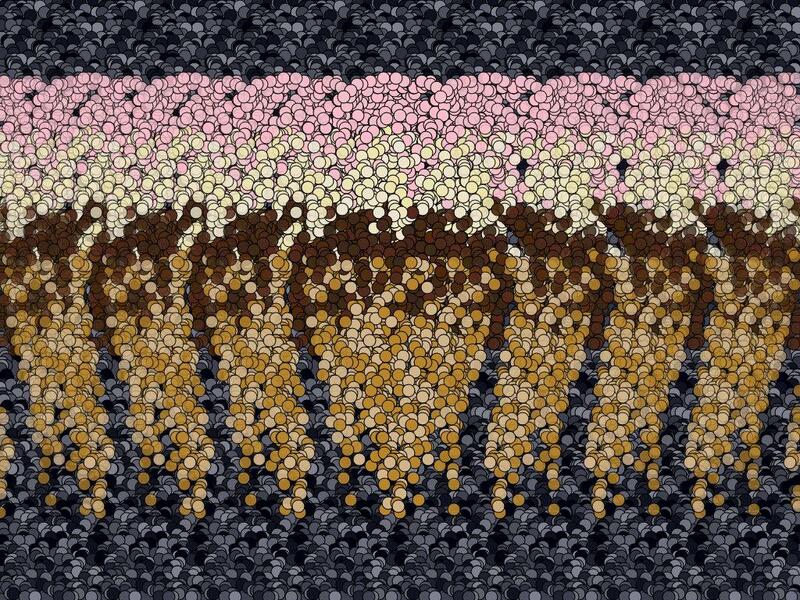 What makes Row of Trees different from other object array stereograms is that it was created entirely from photographs taken at different angles, with no 3‑D computer modeling. The depth you perceive is therefore the natural depth of the scene. Child's Play This is an attempt to combine two types of stereograms: hidden-image stereograms and object-array stereograms. 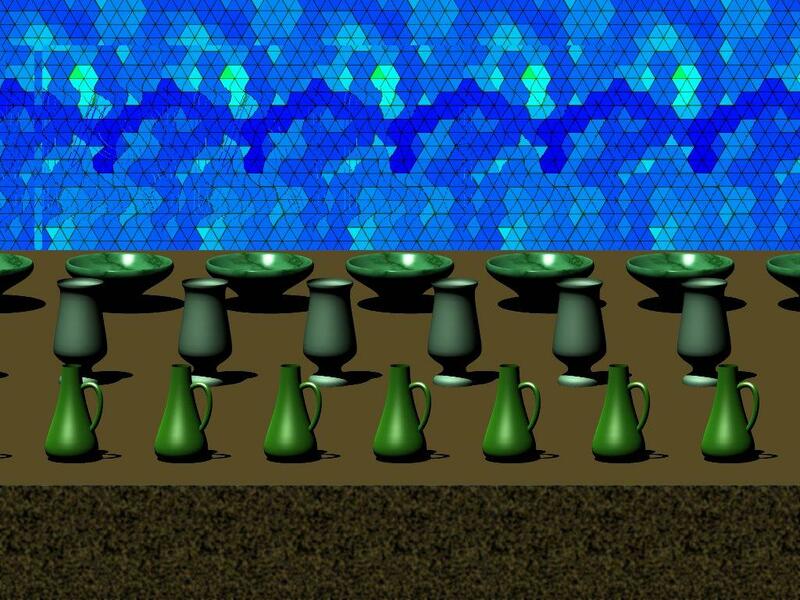 The small toys repeated throughout the picture have depth when viewed in 3‑D but are also positioned at precise heights so as to define a large 3‑D image. The small objects exhibit less depth than I would have liked, but I believe that overall this is a good proof of concept. Caged Creature The idea here was to superimpose an object-array stereogram atop a conventional, hidden-image stereogram. What makes this interesting is that the object in the object-array stereogram is in fact a hole through which the conventional stereogram can be seen. 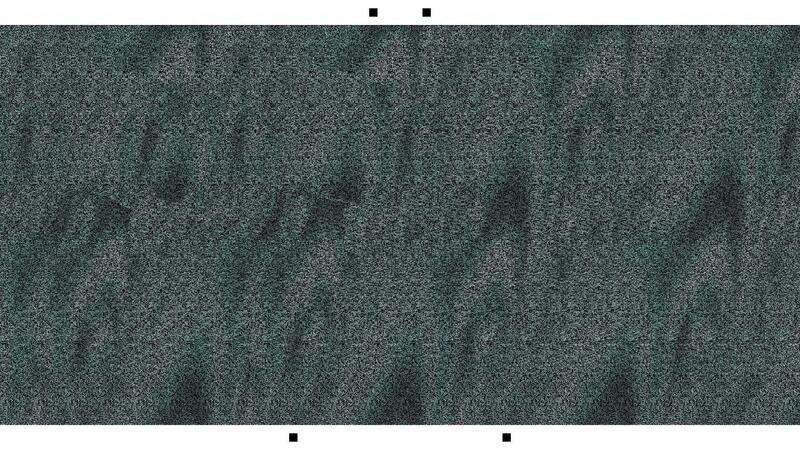 The rest of the object-array stereogram is solid black. Magic Hat The only interesting thing here is that the 2‑D pattern fades from showing a normal Abracadabra on the right side of the image to a reversed Abracadabra on the left side of the image. One Cent This hidden-image stereogram is a photograph, only minimally retouched (straightened, cropped, resized, and white balanced). 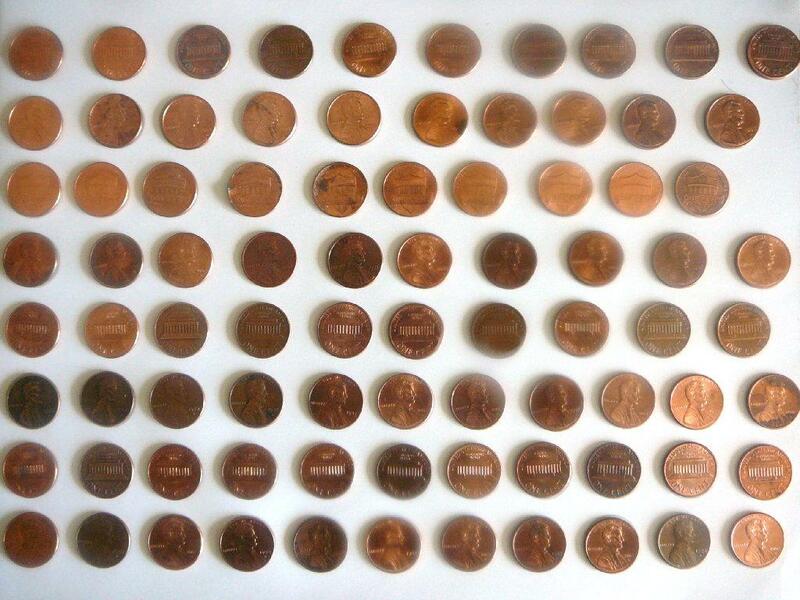 The things I learned from this exercise are that (1) it's really tedious laying out dozens of pennies on a sheet of paper, and (2) with a 19mm diameter, pennies form rather large pixels. Consequently, I was able to make the underlying height map only 10×8 pixels—0.01% of the resolution of most of the other stereograms on this page. In case you can't decipher the 3‑D image, it's supposed to say 1¢ on a sloped background. Butterfly This stereogram is both horizontally and vertically symmetric. Flip it across either Cartesian axis, and it will look the same. Snowflakes When viewed in 3‑D, one snowflake appears higher than the other in this object-array stereogram that is also a valid QR code. The snowflakes are a little hard to focus on—perhaps try each in turn—but the stereogram does work well as a proof of concept. 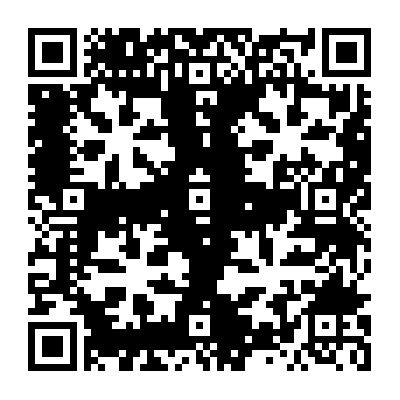 I used Russ Cox's QArt Coder to produce the QR code. King Me Like Put on a Happy Face (above), King Me is an attempt to construct a stereogram entirely out of undistorted shapes. Unlike Put on a Happy Face, however, King Me allows the shapes to overlap, which produces a crisper image. The 3‑D image, which is supposed to be a crown, isn't as detailed as I'd like, but that's a subject for a future stereogram. We All Scream The idea here was to combine the coloring of Apple and Orange, the transparency of Lovesick, and the undistorted shapes of King Me. Unfortunately, the 3‑D image, which is supposed to be an ice-cream cone, is a bit abstract and, quite frankly, doesn't look nearly as nice as I would have liked. Straight Lines Following the theme of Goldfish Bowl (above), I wanted to see if I could combine stereograms with other types of optical illusions. 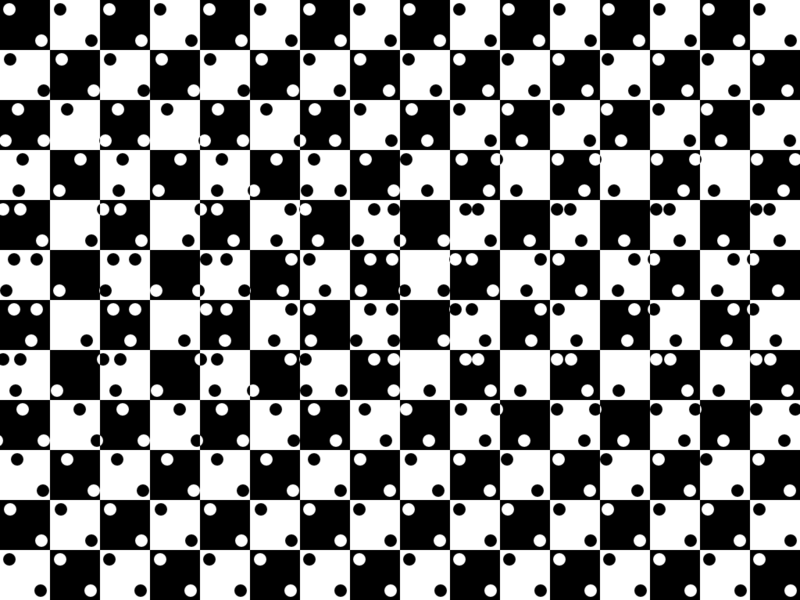 In Straight Lines, the optical illusion is that the checkerboard pattern is perfectly straight and regular, even though it looks crooked. 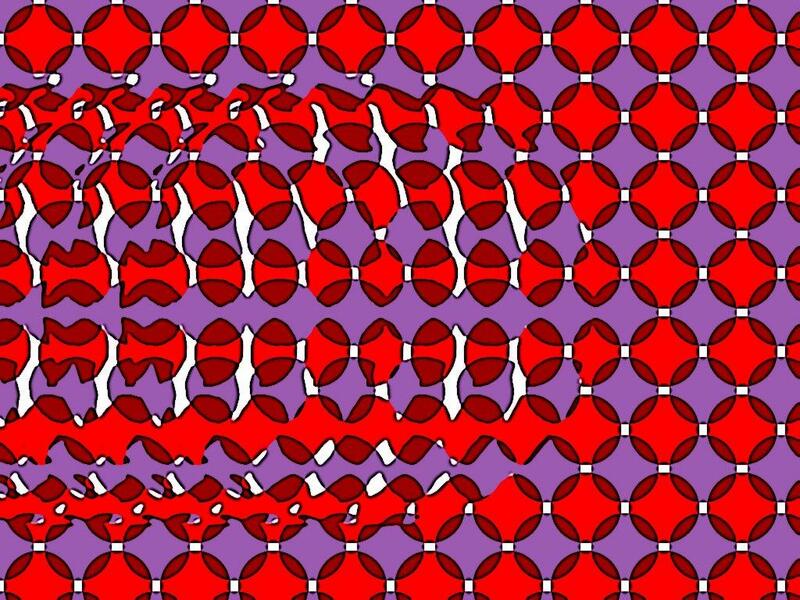 The 3‑D image is, alas, just a boring diamond shape. I wasn't able to achieve the resolution needed to do better without sacrificing the optical illusion. Room and Mushroom I had wanted to do something like this for a long time and finally figured out how. Room and Mushroom shows different 3‑D images at different zoom levels. When viewed at 100% zoom (1920✕1080 pixels), the image depicts a living room. When scaled down to 25% (the equivalent of 480✕270 pixels), the image depicts a large mushroom. The living-room images unfortunately contains some distracting coloration; use the top guides to help focus (and use the bottom guides to help focus on the mushroom). A DjVu version of Room and Mushroom lets you separately display the foreground (living room) and background (mushroom) images. Fun and Games Is it possible to create a stereogram whose 2‑D image is a maze? The answer is sort of. In Fun and Games, the 3‑D image is supposed to be Pac-Man, but it's unfortunately rather hard to identify and even rather hard to focus on. 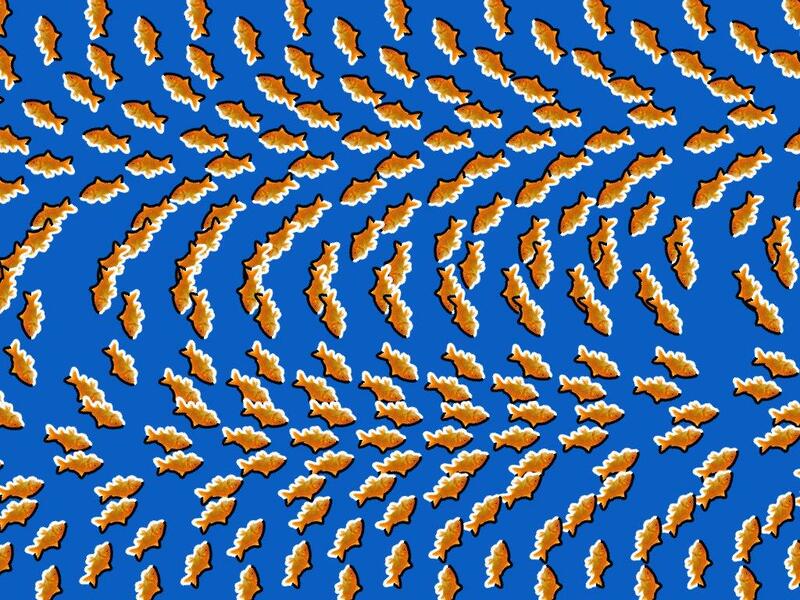 Use the ghosts at the top to help align your eyes. The 2‑D image isn't too terrible, though. 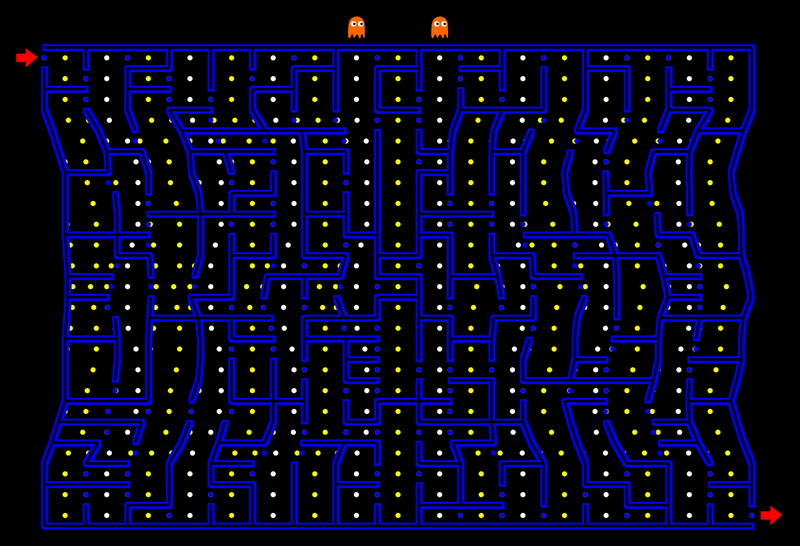 For the solution to the maze, load the SVG version of Fun and Games into Inkscape and mark the Solution layer as visible. 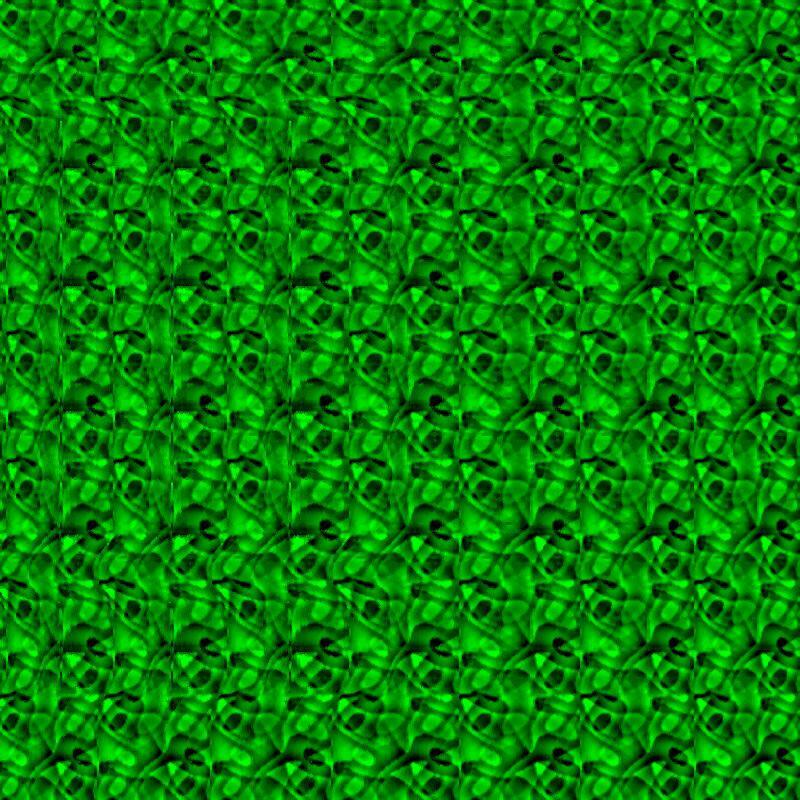 Ode to Quadrilaterals This stereogram shows four quadrilaterals popping out of a concave background. What's interesting here is that the 2‑D image is itself composed entirely of quadrilaterals, all with crisp borders. An SVG version of Ode to Quadrilaterals is also available. Cubism Bear I wanted to see if it's possible to make a stereogram in which the background pattern portrays a recognizable object, challenging the requirement that a background pattern be a repeating tile. 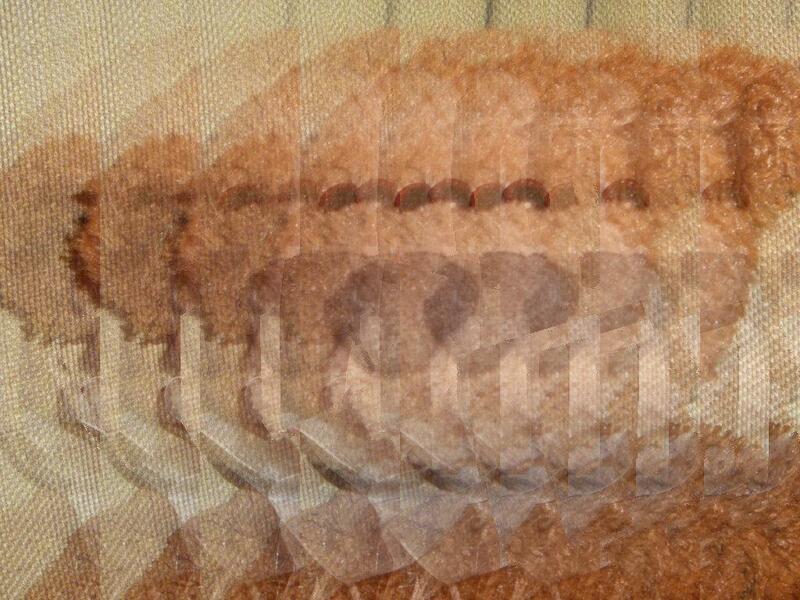 Cubism Bear overlaps partial images of a teddy bear, as might be done in a cubist painting, to accomplish this feat. Flower Photo Like Room and Mushroom (above), Flower Photo presents different 3‑D images at different zoom levels. The difference lies in the interpretation of the smaller image. When viewed at 100% zoom (1024✕768 pixels), Flower Photo is a hidden-image stereogram of a camera. When scaled down to 25% (the equivalent of 256✕192 pixels), Flower Photo changes from a hidden-image stereogram to a side-by-side stereogram (i.e., image pair) of a flower. Two Monets Continuing the theme of Room and Mushroom and Flower Photo (above), Two Monets represents a combination of two images. In this case, the 3‑D image is Monet's Grainstack, Sun in the Mist, and the 2‑D image—best viewed at a distance—is Monet's In the Garden. Although it's a little hard to focus on the 3‑D image, Two Monets does show that it's possible to superimpose a non-repeating 2‑D image on a stereogram without completely destroying the 3‑D effect. Household Items The defining characteristic of a wallpaper stereogram is repeated images. 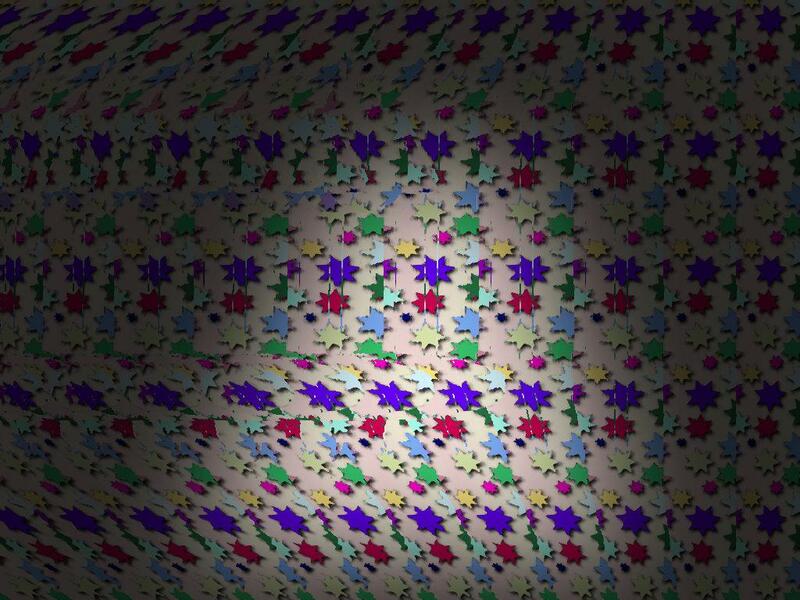 But can one produce a wallpaper stereogram in which no image is repeated? 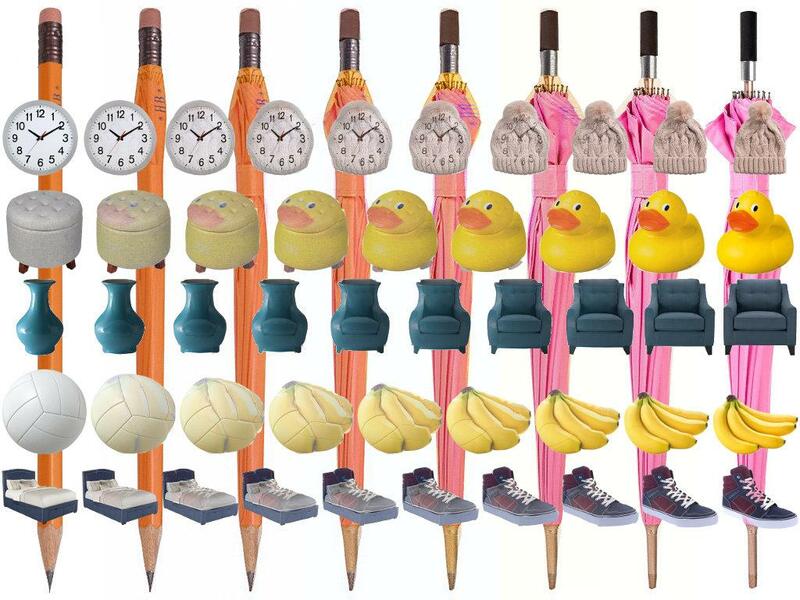 Household Items is based on images morphing into each other—a pencil into an umbrella, a clock into a hat, etc.—sufficiently gradually so as not to disrupt the 3‑D effect. I'm pleased this works as well as it does. 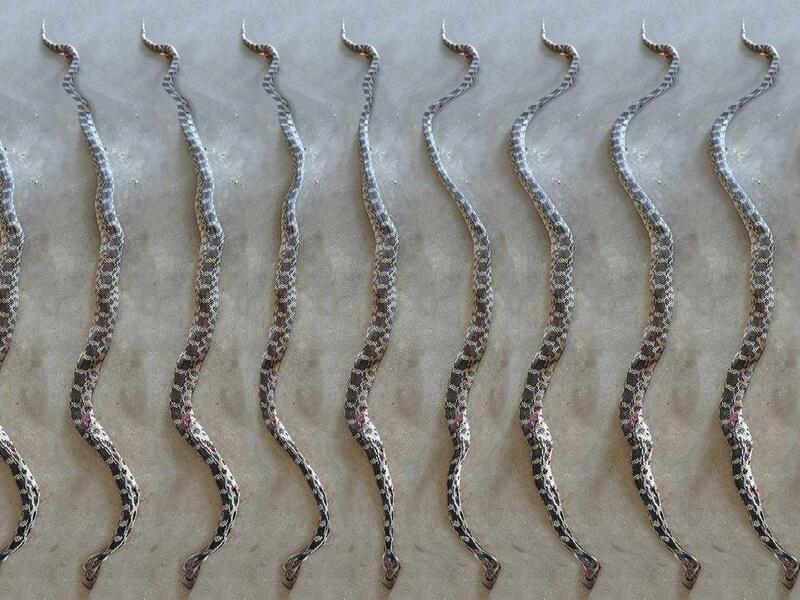 Big Snake Mouth A single-image stereogram's 2‑D tiles are typically discontinuous across repetitions. The effect is particularly noticeable for tiled photographs. For Big Snake Mouth I tried to make the tiling seamless. Although successful, I had to sacrifice sudden changes in depth in the 3‑D image, which is a severe limitation. Sombrero This stereogram is an experiment in overlapping multiple 3‑D images at different depths. 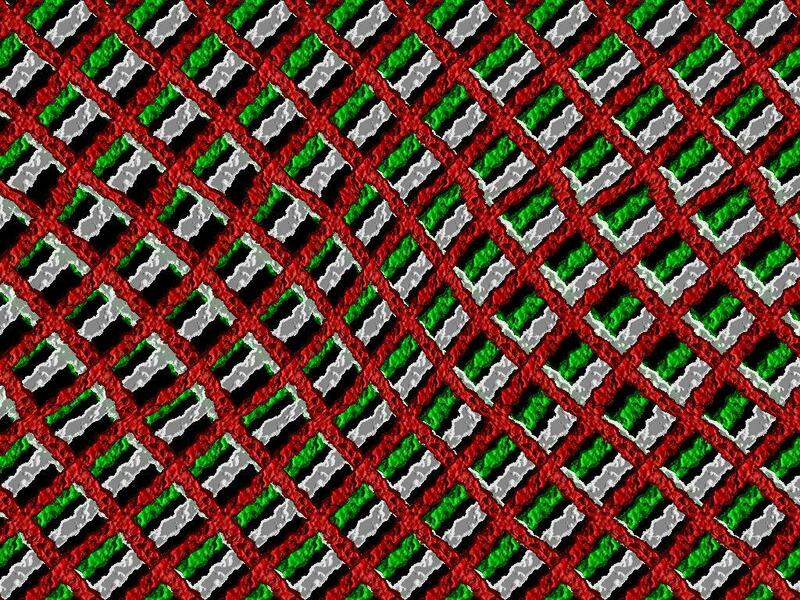 Notice how, especially near the center of the image, the red mesh is raised above the white mesh, which is raised above the green mesh. I like this effect although I don't think I did such a great job modeling a sombrero. 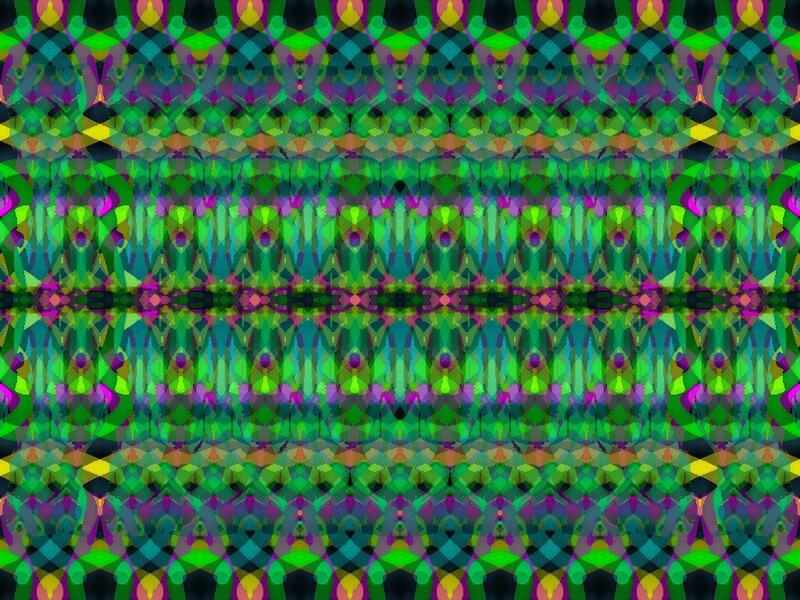 These stereograms were created using a variety of open-source tools plus some custom programs and scripts. All images are Copyright © 2019 Scott Pakin and are licensed under a Creative Commons Attribution-NonCommercial-NoDerivs 3.0 Unported License.